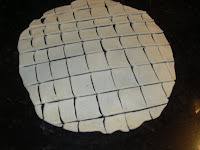 This is another version of making biscuits with maida flour. Here is the recipe. Add baking soda, a little amount of salt, 1 tsp of oil and asafoetida powder to maid and add a little amount of water and make it a soft dough. Spread it into a 7" roti. Cut it into small pieces and fry it to golden brown. Let it cool for a minute. Now put it in a container, sprinkle the remaining salt and chillie powder, cover the lid and shake it nicely. 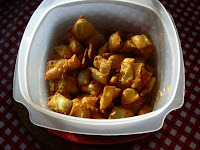 This is another snack, we can give it to kids. If its too spicy for kids, then avoid adding chillies and try adding a little amount of pepper powder. You are right Vani, My mom used to make it and store it in a air tight container every other week.